MARTHA MOMENTS: Martha Bakes Nominated for Two Daytime Emmy Awards! Martha Bakes Nominated for Two Daytime Emmy Awards! Congratulations are in order! Martha Bakes was nominated for two Daytime Emmy Awards: Outstanding Culinary Program and Outstanding Host for Martha Stewart! The program, which is now in its fourth season, is the most watched cooking program on PBS with an average of 1.2 million viewers a week from around the United States. Martha Bakes is the most visited show on PBS's digital cooking portal, PBS Food, and recipes from the show consistently rank among the top viewed recipes on PBS Food. The series has been viewed in 95% of U.S. television households, according to TRAC Media Services. I believe this is the first time the show has been nominated for an Emmy Award! Congratulations to Martha, PBS and the entire Martha Bakes team! This is a photograph I took of Martha Stewart's Emmy Awards when I was on her program in 2010. They were all arranged in the green room on a console table from the Martha Stewart Signature furniture line. 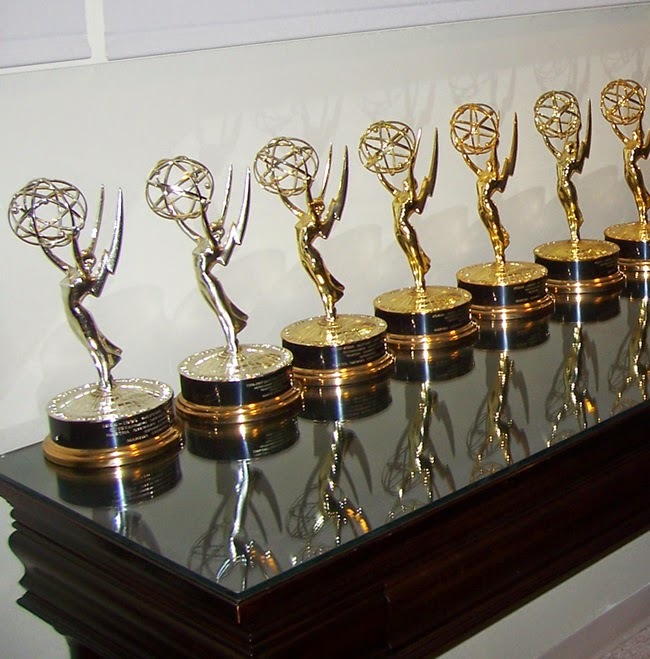 Only seven of the 18 Emmys she has won over years are shown here. Let's hope that this much deserved show and Ms Stewart will win the Emmy. I am also hopeful that it may secure a Martha Stewart gardening/garden tour show. I would love a gardening or garden tour show. Home Depot would be a great sponsor for the series.